Good morning and welcome to this weeks SOS. I have been on holiday this weeks so I have been of course spending lot of time on the garden. I attempted to tidy up the shed something I have to been wanted to do for a while. I bought some shelves from Homebase but unfortunately my sense of size let me down again as one of the shelving units was too tall. Luckily I could split the unit into 2 something I was always planning on doing……at least that is what I said to my Nephew Tom who was helping me. Now I have shelves unfortunately they are messy shelves. I guess I will have to tidy them up later but little shelves. Other tasks this week has included putting my cold frame into storage for the warmer months, transplanting a Clematis, moving some unused sleepers, moving some Hosta from a damp border into pots and a general tidy up. I went for a day out in Whitley Bay in North Tyneside on Tuesday at the Spanish City. The Spanish City is a legendary building on the coast and was built at the turn of the 20th century and was famed for it’s fun fair and main building which had a huge dome. It closed 20 years ago but after investment for the Heritage Lottery Fund it reopened last year. A lot of work was carried out landscaping the gardens outside. As you can see one of the perils of gardening beside the North Sea is the dry conditions. We always get less rain than other parts of the country but it is also made worse by the wind that comes blows down The North Sea from the Arctic and acts a a drying wind. I went to see James in concert at the Usher Hall in Edinburgh last week. I have been a fan ever since the 90’s and have been lucky enough to seen them 6 times in the last 10 years. These caught my eye when I was looking around the merchandise stand and saying “how much”! Seems a bit of a gimmick but I will give them a try. I bought 2 and will be distributing them soon at areas TBC. As some people will be aware I have a fascination with these succulents. I bought these ones last year and they when they were fairly mature and managed to get 20 babies off of them. They are slow growers and you need to be patient but you patience will be rewarded with these amazing symmetrical patterns of concentric circles. After a dormant winter when they turn grey they burst into life in the spring. A native of places like Mongolia and Serbia they will withstand very cold weather but like to be kept dryish. Hopefully these 3 will flower this year and produce more babies. They are monocarpic like Sempervivums and they die after they flower but live on in their babies. A somewhat over looked Sedum/Stonecrop probably because it can be intrusive. By kept under control in a small border it rewards you with a wonderfully kaleidoscope of green, yellow, orange and reds. It changes colour throughout the season. This one is in a small border about 4 inches across. After some Camellia envy I have taken the plunge and treated myself to my first Camellia. I have planted in a shady place and with a heap of Ericaceous compost. Any tips would be gratefully received. A Irish primrose this is a prolific old fashioned flowerer. A white flower with hints of light pink in on the edges of it. This was rescued in the bargain corner of a garden centre last year. It is growing that fast it will be ripe for dividing in it’s first year. That is my SOS for this weekend. I hope you have enjoyed it. I away for a boozy weekend in York this weekend so there will be very little gardening for me but will make up for it next week because the nights will be longer after the clocks spring forward this weekend. That Orostachys spinosa sounds as though it would be happy in my garden! I’ll keep a lookout for them….. Well done finding that pretty primrose. Hi Jane nice hearing from you. Yes that Orostachys is rather nice isn’t it. 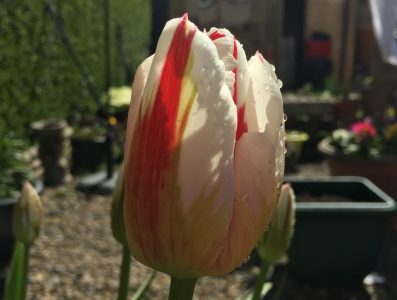 When I came home from work yesterday I also noticed the drought … my bamboos are thirsty and the tulips in pots too: watering is the job to do today! For camellia I did like you and nothing more. If the place was well chosen it will take a little time to settle and you will enjoy. I loved James too and have seen them in concert, love the thought that he is producing seed bombs! That Orostachys is mesmerising, I could just look at it for hours. Enjoy your boozy weekend, hope it is hangover free! Thanks glad to say it is hangover free. That is a relief getting to old for Hangovers…. Going to have Sit Down and The Three Amigos song in my head all day now. I don’t think I have space for a camellia of my own, I’ll just have to admire them from afar! That irish primrose is lovely. Not seen one before. Beautiful, symmetrical Sedums! Shame about the wind/drought damage in the first picture. Thanks Granny I am sure they have planted plants hardy enough to bounce back. I like your stonecrop, it does look interesting as you say. James and seeds. Not very rock and roll is it!? Thanks Quilting. Give surreal ago but stay within you limits. I love that your plunge into Camellias is with an obscure old Spanish variety that I’ve never heard of. And I suppose you’re going to tell me you picked it up for 3 quid in Aldi. I must get an Orostachys, that would be worth more credits with the missus than you can imagine. No it wasn’t a Aldi Special I am afraid. Your Irish primrose is very lovely. And I too have the ‘Sit down’ earworm! Yeah sorry to do that Jude nothing worse than an ear worm…best of it is they didn’t play sit down! I love that you’re branching out into seed bombs and camellia, Paul. I’m sure succulents will remain your passion though and seeing that Orostachys I can see why. Your FIRST camellia? Wow! Camellias were some of the first big flowers that I can remember from when I was just a little tyke. They became one of or major crops back in the late 1990s. I think that they are easy to grow, but I am in a region that they do quite well in. I can not advise on growing them there because I do not know the climate. If they must be potted to keep them portable, they should be pruned for confinement. (It may take them a few years to get too big and in need of pruning of course.) Every several years, they should be removed from their pots so that circling roots can be cut a bit, and a bit of new soil added below the old soil as it deteriorates and ‘collapses’. (I refer to that process as ‘stuffing’.) This will set them back a bit, and might interer with the next bloom phase. If done right after bloom (which always seems like the wrong time to do it – since new growth will be appearing), they often recover so that the following bloom phase is not at all compromised. Hey, I just remembered that I shared five of Brent’s pictures of camellias yesterday, although I did not talk about them much. Actually, I did two SOS yesterday, with five camellias each. Wow, I am too tired to think clearly.